Wireless headphones, a cordless computer mouse, and even wearable fitness bands that stream data to our Smartphones are all ways that Bluetooth technology has impacted our lives today. While different types of wireless technologies have been used for decades in medical devices and healthcare, Bluetooth Low Energy (BLE) is a fairly recent innovation that is changing the way the healthcare industry is experiencing wireless connectivity. BLE uses far less battery power than traditional Bluetooth technology, yet offers a comparable connection that is both robust and reliable. Due to its capabilities, low power and cost, BLE is ideal for medical applications. The significant number of medical and personal mobile devices supporting this technology is making it possible for hospitals to better engage with their patients before, during and after each visit. According to a 2013 eClinicalWorks Survey, 93% of healthcare professionals believe mobile apps can improve patient experience and outcomes. For example, Wayfinding applications can be used to help minimize frustration and increase patient satisfaction during an often stressful or confusing experience. Wayfinding uses Smartphone capabilities in addition to location-based technology, such as Real Time Location Systems (RTLS), to create an indoor navigation system. 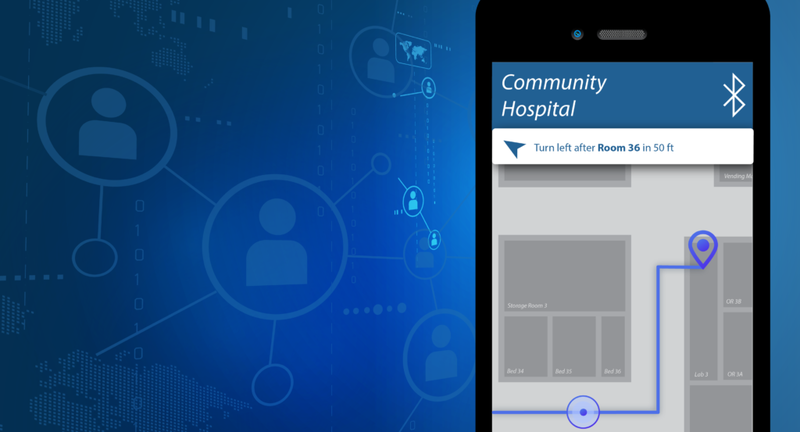 Patients and hospital visitors can use their Smartphones to find their destination in a complex healthcare facility of multiple buildings, floors and rooms. From the parking garage where they are able to drop a location reminder to help them easily return to their parking space, turn-by-turn directions and real-time map views are then provided (much like a standard GPS). Additionally, lost and unhappy patients may create an even more expensive problem than the possibility of negative HCAHPS scores. When patients get lost, they often end up late for their appointment which has the potential to back up schedules and create costly inefficiencies. The combination of RTLS and BLE technologies also enable event-driven triggers based on proximity sensing and timing which may help streamline numerous clinical processes. Automating patient check-in when their mobile device is located at their destination, such as the imaging department, can deliver a seamless experience upon arrival. During their wait, they can be provided contextual content such as the facility’s latest technology and advancements in diagnostic imaging. Subsequently, at the end of their visit before the patient exits the facility, a brief survey can be pushed to the patient’s mobile device in an attempt to resolve any issues before the official HCAHPS survey is sent out. For a caregiver, BLE-enabled devices and wearable technology using RTLS, could create a more efficient workflow and a hands-free approach to patient care. For example, a BLE-enabled staff badge and workstation would allow for the EHR to automatically authenticate and log the user in and out of the system based on their proximity – i.e. being within 12 inches of the station. The less time a caregiver spends looking at a screen to log in and manually document information, the more time they are able to dedicate to engaging directly with the patient. As mobile health continues to introduce innovative ways to help healthcare organizations engage patients and improve outcomes, CenTrak ensures to embrace all new technologies to provide a “future-proof” RTLS investment. In February 2015, CenTrak announced the introduction of Bluetooth Low Energy to its RTLS platform. The complexity of locating assets, patients, staff and visitors in the healthcare environment requires a fully integrated combination of diverse technologies to achieve maximum benefit. CenTrak’s BLE functionality is one of the many technologies supported by our Clinical-Grade Visibility Platform™ used to improve the utility of CenTrak’s location services. When selecting an RTLS provider, healthcare leaders should consider a multitude of technologies for their enterprise location services strategy. BLE is just one piece of the puzzle and it is recommended to evaluate solutions that will meet your current and future location accuracy needs (i.e. room-, bed-, bay-, or chair-level) and system interoperability requirements. For information on how implement and leverage BLE technology, including Wayfinding and other advanced location-based use cases, request more information here.